21 Loudoun Street, Mauchline, East Ayrshire. Poosie Nansie's hostelry from a postcard. The Poosie Nansie Burns Club 293 was instituted in 1921 and federated the same year. The main event of the year is our "Burns Supper". Although the club only has around 18 members, this sell out event annually attracts over 120 guests, proceeds from this provides funds for the tri school burns recital competition. 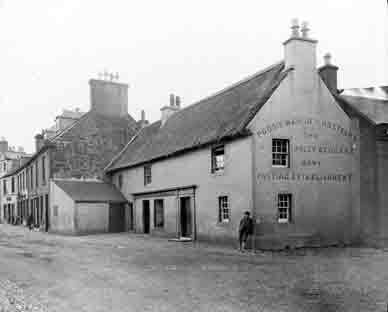 Poosie Nansie was the nick name of Agnes Gibson,wife of George Gibson, and the owner of a Mauchline tavern much frequented by beggars and 'gangrel bodies'. 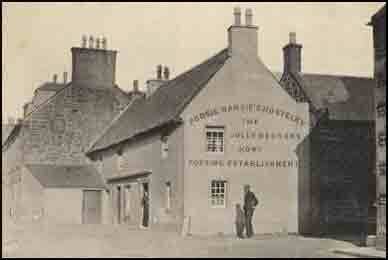 It was this Inn in the Cowgate which Burns visited, and where the revels which inspired 'The Jolly Beggars' took place. They had a son, Jock, and a half-witted daughter, known as 'Racer Jess', because of her speed in running errands. To read more about Poosie Nansie's and the club please visit their wonderful site.